Photos by Jane Cook © Jane Cook 2003; all rights reserved. The grave of the mare (The) Mersey at St. Albans Stud. Left, an old photo from the Bloodstock Breeders' Review. 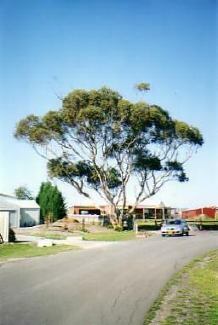 Right, the same site today, in a modern subdivision. ST. ALBANS STUD and Racing Stables, located at Geelong, Victoria, Australia, was founded by James Wilson in the 1860s. It was later purchased by W.R. Wilson (no relation), who stood the stallion TRENTON (1881 by Musket), twice leading sire in Australia, sold to England in 1896. Top sires BILL OF PORTLAND and STRATHMORE also stood at St. Albans. In all, 9 Melbourne Cup winners were bred here. The grave above marks the burial site of the mare THE MERSEY (1874, by Knowsley), dam of New Zealand-bred CARBINE (1885 by Musket), who won the coveted Melbourne Cup in 1890. CARBINE stood initially in Australia, where he got the future leading sire WALLACE, and was later sent to England where he had a successful career, siring Derby winner SPEARMINT among his best. 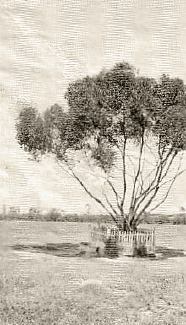 THE MERSEY was buried under a gum tree, which still stands today (see above). Also buried at St. Albans are the mares MISCHIEF (1865) and MUSIDORA (1859). In 1895, the Stud was sold via lottery and changed hands several times. In November of 1930, St. Albans was used as the secret hiding place of the great PHAR LAP, who had been the victim of an assassination attempt prior to his victory in the Melbourne Cup. The property is now a housing development, with streets named after people and horses that helped make St. Albans Stud famous. -- A.P. Amended by P.E.